Tron is like the penny stock of cryptocurrency. Its humongous supply and the cheap price tag has helped it to make it to top 15 cryptocurrencies on CoinMarketCap. For those of you who don’t know about Tron (TRX), it is one of the largest blockchain-based operating systems in the world and is known for its high output. It is now trying to be the next Ethereum with virtual machine capabilities to enable smart contracts and DApps. That’s why it is being talked about and is getting the major push from China. And when a crypto is being talked about in China, you know the consequences could be similar to NEO’s uprise. Being in the top 15 is enough to get noticed and that’s why many services/exchanges have started dealing in Tron. But before telling you about those services, let’s look at all the avenues through which one can buy Tron. Where To Buy Tron (TRX)? Any currency that is in top 20 cryptos of CMC list is usually easy to be bought through bank or wire transfers. For TRX too, there are quite a few services/exchanges that provide you the access to fiat linked crypto wallets where one can deposit fiat and exchange it for cryptocurrencies like TRX. TRX can be bought and sold in fiat currencies like USD, INR, CNY, KRW etc. Note: To get access to such accounts one needs to go through a thorough KYC check so this method is not anonymous. #2. 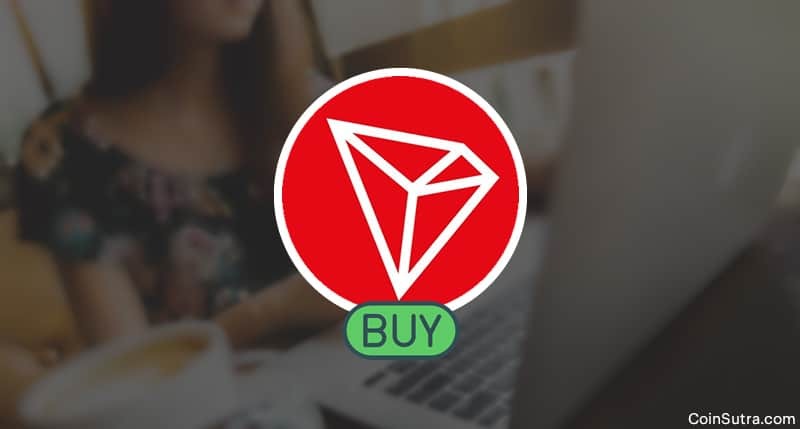 Buy TRX in exchange for other cryptos or ETH/BTC etc. A plethora of centralized cryptocurrency exchanges have mushroomed in last one year and each of them offers numerous popular cryptos. And TRX is no exception. One can buy TRX easily from such exchanges if they have other cryptocurrencies like BTC or ETH or USDT. Credit and debit cards are the easiest way to buy any cryptocurrency and TRX is no exception to it. But this option is limited only to some cryptocurrencies. TRX is one of them. Also, there is only one service as of now that lets you buy TRX using credit/debit cards. TRX doesn’t have any peer-to-peer platform as you have for BTC and ETH where traders can interact and deal in peer to peer fashion. That’s why it is difficult to buy/sell TRX for cash. However, if you find buyers/sellers in your local community through word of mouth then you can definitely deal with them. But this involves risk as there is no escrow in between and you could get scammed. TRX got a lot of traction during the last bull run and they have now pivoted from their original goal of being the gaming currency to a full-fledged decentralized platform for the decentralized web. And it is yet to be seen that how the market responds to it and we can’t say much about because the market is quite uncertain as of July 2018. But, we will keep updating this piece as and when we keep getting updates from the TRX community. Lastly, if you are someone who has a significant amount of TRX, you should not leave them on above listed centralized exchanges. Instead, you should download their official wallet from here. Now you tell me: What do you think about TRX? Are you invested in TRX? If yes, which method have you used to buy your TRX from the above list? Did I miss any other notable ways to buy TRX?